Miami Trace senior Olivia Wolffe fires a pitch during the season-opener against Olentangy Berlin at Miami Trace High School Wednesday, March 27, 2019. Wolffe pitched a complete game, one-hitter for the win. The Miami Trace Lady Panthers varsity softball team opened the 2019 season with a non-conference game at home against the Olentangy Berlin Bears. The weather was sunny with temperatures in the upper 50s and virtually calm conditions. Miami Trace won the game, 3-0. Olivia Wolffe started and pitched a complete game, one-hitter for Miami Trace. She struck out 12 batters and issued one walk. Miami Trace scored all the runs they would need with two in the bottom of the first. Kaylee Hauck led off and reached base on an error. Sidney Payton reached on a fielder’s choice. After the next two batters were retired, Wolffe hit a double to center field, scoring Hauck and Payton. Miami Trace added what would be the final run of the game in the fourth inning. With one away, Wolffe singled to right field. Devin Thomas was sent in as a courtesy runner. With the second out recorded, Cassidy Lovett reached on an error that allowed Thomas to score. Wolffe was cruising along nicely and retired the first batter of the inning. The next batter for the Bears, Burkhart, hit a solid single into right field. The following batter hit a grounder very hard back to Wolffe, who got her glove on it, but the ball rolled over between the pitching circle and first base, leaving both runners safe. The next batter popped out to Lovett at second base and then the final out of the game was recorded when catcher Jessica Camp threw down to third base to Ashley Campbell covering, tagging the would-be base-stealer out. “Olivia Wolffe had a good night tonight,” Miami Trace head coach Joe Henry said. “We’re going to see that a lot out of her. “She was working on a no-hitter going into the last inning,” Henry said. “They had a nice shot into right-center. We held her to one base. “We had a nice play from Ashley Campbell at third,” Henry said. “They had the tying run at the plate with two runners on. Miami Trace is at home Thursday, taking on Ross Southeastern at 5 p.m. 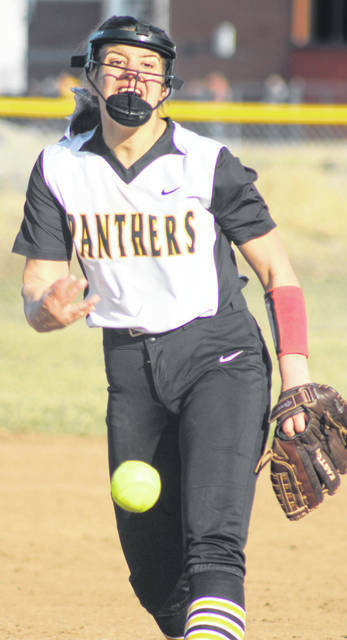 The Lady Panthers have a doubleheader scheduled for Saturday at home against Whitehall-Yearling with the first game at 11 a.m.
Offensively for Miami Trace: Kaylee Hauck 0-3, roe, 1 run; Sidney Payton 1-3, 1 run, fc; Jessica Camp 1-3, 1 2b; Ashley Campbell 0-3; Olivia Wolffe 2-3, 1 3b, 2 rbi; Devin Thomas, 0-0, 1 run; Maddie Mossbarger 0-3, fc; Cassidy Lovett 0-3, roe, 1 rbi; Krissy Ison 0-2; Breanna Eick 0-2, 1 bb.